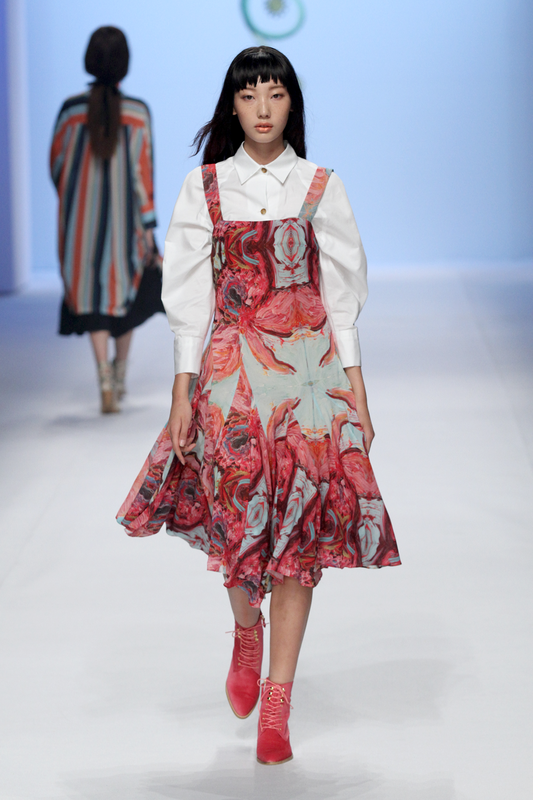 Hera Seoul Fashion Week Spring/Summer 2016 is underway at Dongdaemun Design Plaza. MUTZINE has exclusive coverage of the runway shows this season featuring top models, celebrity cameos, and of course, the latest fashions. Here's the rundown of the action from day four. Review what happened on days one, two, and three. 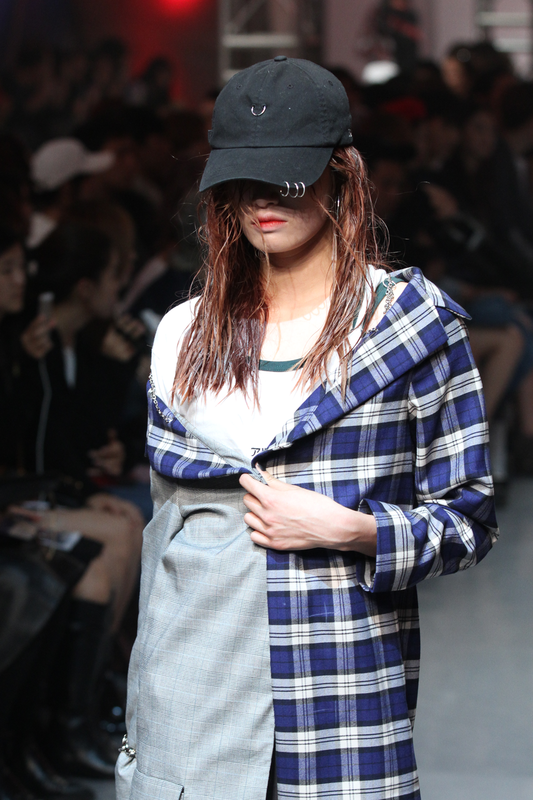 Known for designing costumes for the biggest idol stars such as AOA, VIXX, and Girls’ Generation, Hong Hyejin consistently produces chic and minimalist looks for her own brand, the studio K. This season was no exception with a collection that encompassed all the season’s biggest trends including pajama dressing, sheer elements, pastel pink, and flatform sandals all topped off with baseball caps and visors. The economic concept of the "Productivity of Added Value" was expressed through mathematical symbol earrings, calculated cuts, and precise seams. As for the beauty look, the women had their eyelids painted with a stroke of yellow while the men’s temples and cheekbones were accentuated with a brush of stark white. The Big Park show opened with “The Young Person’s Guide to the Orchestra” from the soundtrack of Wes Anderson’s film Moonrise Kingdom, which follows the story of two young adolescents as they explore the wilderness. This theme of nature was evident through the multiple floral patterns that were mixed and matched. Besides featuring the Moonrise Kingdom soundtrack, other elements of the show felt inspired by Wes Anderson’s visual aesthetic; the soft, ruffled and scalloped shapes evoked a sense of whimsy and wonder, the color palette matched that of Anderson’s best films, and the blush and freckles (much like the makeup at Cres. E Dim) was a reminder of Suzy, the youthful protagonist. 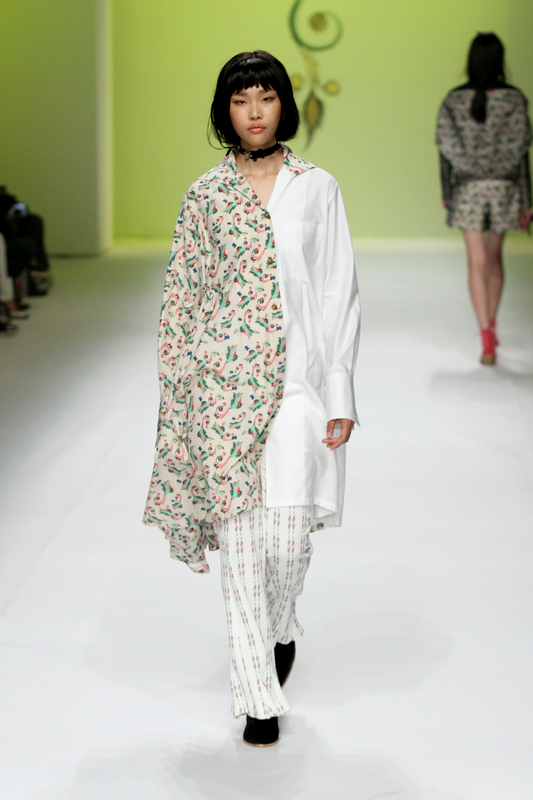 R. SHEMISTE presented the clearest conception of the east-meets-west ethos with eastern Asian motifs layered on and woven into a 70’s London Punk feeling. 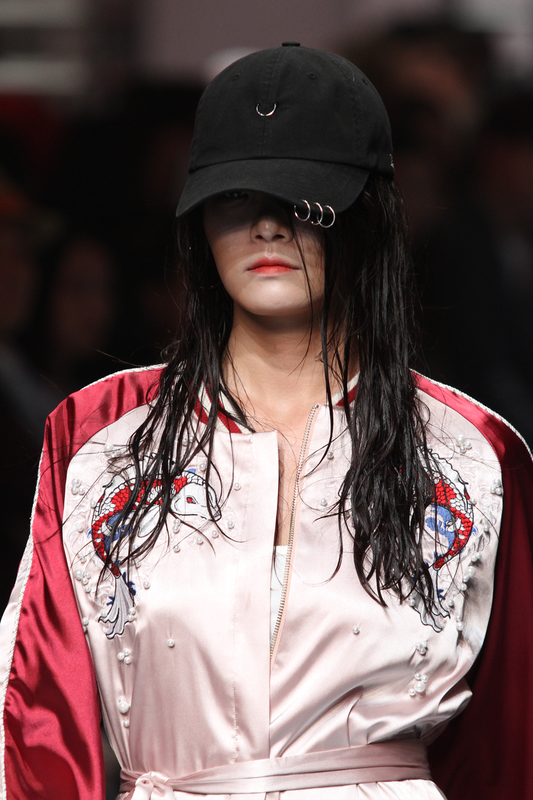 Every model marched out in black, pierced baseball caps, giving the illusion that the model’s eyebrows were pierced. The Japanese influence was made explicit through patches featuring the famous woodblock print “The Great Wave off Kanagawa,” shirts with R.SHEMISTE embroidered in katakana, silken varsity jackets with koi fishes, and pearls attached to the ends of sleeves. Equally as important was the western punk spirit embodied by the fabrics and materials – ripped denim, manipulated suit materials, and flannel fabrics. MUTZINE got a sneak peek of the JARRET collection last month at New York Fashion Week, when the brand was invited to show at Concept Korea alongside KAAL E.SUKTAE. For Seoul Fashion Week, the show’s intensity was turned up a couple of notches as the mini-collection shown in New York was expanded to menswear and even more women's looks. Distorted apple motifs and block text served as patterns and prints. The apple is a reference to the story of Snow White, which was also reflected in the women’s makeup with white-as-snow eyeliner, lips red as blood, and hair black as ebony. SUPERCOMMA B’s central message for the season was “I am your dream.” Given the sheer number of top models and celebrities on the runway, the statement could not be more true for spectators of the show. Irene Kim, Daniel Snoeks, and VIXX LR were among the top billed names. With muddied neutral colors, the designers created an easy, unisex collection where almost every piece was oversized and made of comfortable jersey or fleece. Mid-way through the show, the Iggy Pop soundtrack was paused for Yoon Mirae’s “Payday” (which was infamously featured in the film, The Interview) while Tiger JK and Yoon Mirae took a stroll down the runway. Immediately following the quick interlude, Iggy Pop came back on in full force and flashy sequins for both men and women sparkled down the catwalk. For the finale, Daft Punk blared through the speakers as Tiger JK, Yoon Mirae, and VIXX LR led the mass of models for one last walk.